Technologies and measurement systems that accurately and efficiently measure all material quantities in actual environments. In order to improve construction quality and supply more reliable equipment, it is vital to use accurate measurement technology at construction sites. Shinryo has combined various measurement technologies including the most advanced laser measurement methods with mobility, sensing, interfaces and other robot technologies to develop measurement systems that are highly precise, highly efficient, and easy to operate. This is a laser measurement – marking system equipped with a motor-driven total station. It can be operated remotely from a tablet terminal. It includes a function that links data with Shinryo’ s S-CAD, the 3D-CAD. Its measurement unit can measure parts hidden in shadows (precision: within ±5mm). Its marking unit can mark at a precision within ±2mm. The system inherits the technology of our fully-automatic ceiling marking robot (Marking Robot). 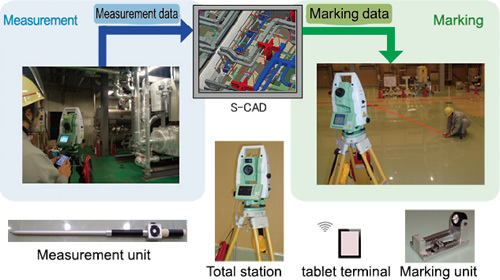 This is a measuring instrument that can be used to represent the shape of an existing building or equipment as an expanded three-dimensional coordinate aggregate (point cloud data). This technology can be used not only to perform high quality and efficient construction, but to control the operation of existing equipment (facility management) or plan factory production by quickly and accurately converting the point cloud data into an S-CAD model. This is a remotely-operated traveling robot carrying a camera. 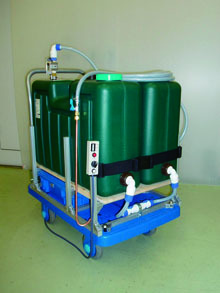 It has good running performance thanks to its crawlers originally developed for rescue robots, and can be used for a wide range of measurements - not only hidden areas such as space above ceilings and inside ducts, but low dew point rooms and clean rooms where people should not work. It can easily be operated remotely using a joypad based on 2 images obtained by a camera mounted on the robot and a fixed camera. 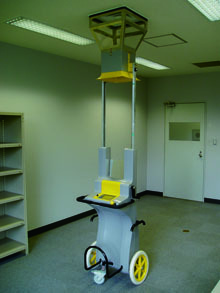 This is a manually-operated airflow volume measurement device that inherits the technology of the fully-automatic airflow volume measuring robot. The unique airflow speed sensor developed by Shinryo can measure at a precision of ±5%. We offer a lineup of three models, each suited to specific usage conditions. This device is used when supplying a constant quantity of water to inspect post-construction quality, flow tests of drain pipes, or the trial operation of a drain pump on a package air conditioning system or fan coil unit. It automatically supplies the correct volume of water by presetting the supply volume with a hand-held controller.